How Does A 300,000 Mile Oil Change Look Like? - Muscle Cars Zone! How Does A 300,000 Mile Oil Change Look Like? 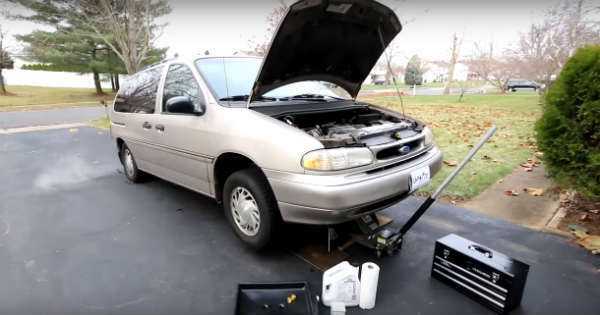 ChrisFix is back with yet another exciting video where he shows us how an oil change on a 1995 Ford Windstar looks like. Now, have in mind that this is not a classic oil change video but something even better than that. His Ford is almost at the 300,000 miles marker. He has bought this vehicle as brand new, and of course as a person who takes care of his vehicle, he did an oil change every 5K miles. We have seen this car many times used in his videos. However, now is the time where he needs to check in what state the car`s engine is in. One very efficient method to determine this is by oil analysis. For this you need an oil analysis kit and then send that oil to a lab. The kind lab who agreed to sample the oil of his 1995 Ford Windstar is Blackstone Laboratories. The condition of the oil can tell you very much about the state of your engine. Chris filled up the bottle with oil and sent it to the laboratory. One week later the results are brought to him and he reads the report. After driving the car for 300,000 miles the results are not really the best which was to some part expected. Unfortunately, they found coolant with sodium and potassium. Coolant might cause excess wear. They also found lead in the oil which comes from the bearings. It also has iron and high copper which is wear at a shaft/bearing interface. They also found aluminum from the pistons. After the analysis, Blackstone Laboratories told him to watch coolant levels and oil pressure. So, there you have it folks, you can perfectly see in what condition your engine is by oil sampling. At last, follow this link to learn how to diagnose common problems with the oil system!